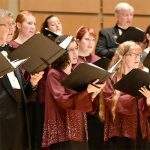 In recognition of founding director Bernie Kuehn’s 30 years of service and contribution to the community, the Oregon Chorale has established an endowed scholarship with the Hillsboro Community Foundation. This ongoing, perpetual award will be for high school and eventually university students wishing to pursue a career in music, and particularly, conducting. If you would like to be a part of this special tribute to Bernie, please contact Cindy Uecker at uecker@europa.com or 503-319-4234.